We just got done voting on nearly 40 amendments to the majority party's supplemental operating budget proposal. It's one of three supplemental budgets we'll need to adopt before session ends on March 8. That's the subject of my latest video update, which you can watch by clicking on the image below. There are some good things in the proposal, including $339 million for mental health services and $156 million to fully fund the State Need Grant. However, the budget relies on a capital gains income tax, which is problematic for a number of reasons. First, this tax would negatively impact small business owners who have worked their entire lives to build their businesses. Secondly, we know that once this tax is on the books, it will likely never be removed. And third, we simply don't need new taxes. The revenue forecast released by state economists last week revealed the state will bring in $1.3 billion more in revenue over the next four years than previously expected. With such a large increase, there is no need for us to adopt a capital gains tax. Senate Democrats have also released their supplemental operating budget proposal. Investments in the budget include $300 million for mental health services, $1 billion for teacher and staff salaries to fully comply with McCleary, and more than $40 million to fund an additional 2,500 State Need Grant slots. Both budgets would cut property taxes in 2019, but unlike the House proposal, the Senate proposal doesn't rely on any tax increases to provide relief to homeowners. After both budgets pass in their respective chambers, negotiators will begin working out the differences in each proposal. It is my hope the final budget will fund key priorities without raising taxes. Relocating and rebuilding the portion of the Interurban trail that will be affected when construction begins on the planned extension of SR 167 to I-5. Expanding SR 167 from SR 18 to Puyallup. Expanding SR 162 between Orting and Sumner. Extending Pierce Transit service through the addition of peak hour trips serving the Pacific Avenue corridor between Downtown Tacoma and Parkland/Spanaway. Last Wednesday marked House of origin cutoff, which means all bills that did not advance out of the chamber in which they were introduced are now considered “dead” for the year. The only exception to this are bills deemed NTIB — necessary to implement the budget. Four of my bills advanced out of the House before cutoff, and are now in the Senate. House Bill 1433 would delink the annual increase in services and activity fees from the percentage increase in student tuition fees, and give our students the autonomy to make decisions based on campus and student needs. The bill advanced out of the Senate Ways and Means Committee yesterday, and is now in the Rules Committee. This means it could be brought to the Senate floor any time for a vote. House Bill 1742 would provide a legal way for auto repair shops to service vehicles with expired tabs. The bill was heard in the Senate Transportation Committee on Wednesday. House Bill 2087 would require drivers to yield the right-of-way to any authorized vehicle or pedestrian working in a designated construction or maintenance area. The bill was heard in the Senate Transportation Committee yesterday. House Bill 2570 would establish a searchable, online database of pharmacies with pharmacists on staff who could legally prescribe vaccines or self-administered hormonal contraceptives. The bill was heard in the Senate Health and Long Term Care Committee yesterday. 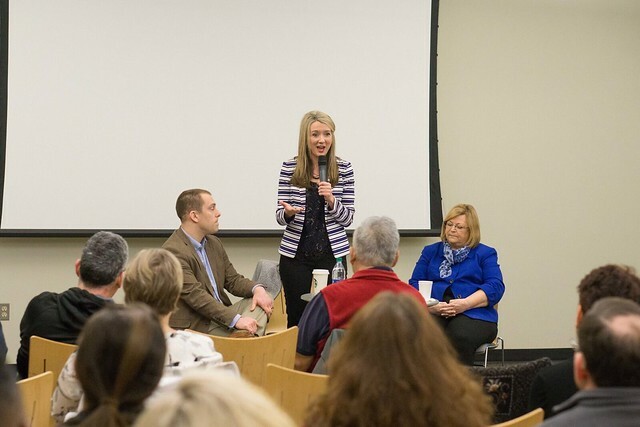 Last weekend, the 25th District delegation hosted a town hall at Pierce College Puyallup. I want to thank those of you who were in attendance and shared your questions and concerns about policies moving through the Legislature. I enjoyed getting to hear directly from you. Topics included funding for community and technical colleges, environmental policies, affordable housing, resources for special education, and paraeducators in our classrooms. Last week, I had the opportunity to sponsor Ballou Junior High School student Devin Sawyer as a page in the state House of Representatives. During his week here at the Capitol, Devin attended page school every day, delivered messages and documents to legislators and staff, and fulfilled other tasks critical to the efficient operation of the Legislature. Getting to spend a week here in Olympia learning about the inner workings of the Legislature is a rare opportunity. I admire Devin for taking advantage of it, and thank him for his service! As we weave our way through the final two weeks of the 2018 session, please feel free to contact me any time with your questions, comments or concerns. My contact information is below.